Season 3 of Sherlock ended with the broadcast of “His Last Vow” last night in the United States, and I’m sorry to say it ended — not with a bang — but a thud. This has been a season of experimentation for Sherlock and I’m happy to give Moffat and Gatiss points for trying new things. But the results have been, at best, and with generosity, middling. I thought Episode 1 of Season 3 was weighed too heavily toward comedy, and something like sketch comedy at that. Episode 2 was a ROM-COM romantic comedy. Either of these was preferable, to my taste, compared to the soap opera of “His Last Vow”. We were also treated to the spectacle of Sherlock being outwitted by a Moriarty 2.0 or Moriarty Reloaded and then, to protect John Watson, shooting dead said Moriarty 2.0; followed by Sherlock’s exile to a fatal secret-agent mission in Eastern Europe. All this would have been tolerable — maybe — if Moffat and Gatiss had honored the relationship- and show-changing dynamics of these stories. But instead, they have John Watson reconcile with Mary (really?) and Sherlock instantly reprieved from his fatal mission because, guess who reappears? Yes, Moriarty 1.0. Did you think he was actually dead? Me neither. Are you wondering why we had to wait an entire season to have Moriarty 1.0 reintroduced? Me too. I believe that Moffat and Gatiss have not willing embraced parody, and are not trying to yank our chains, but this is not good work; and my disappointment is doubled by how good their work was before, which was not simply good, but excellent. Redeeming the weakness in the stories this season were Moffat and Gatiss’ feel for their characters in small moments and the performances of the whole cast, including Benedict Cumberbatch, but especially Martin Freeman, who consistently invested even the most absurd situations this season with complete and moving conviction. I looked forward to Season 3 of Sherlock with hope and anticipation. I’m afraid I can’t consider a Season 4 with either emotion. 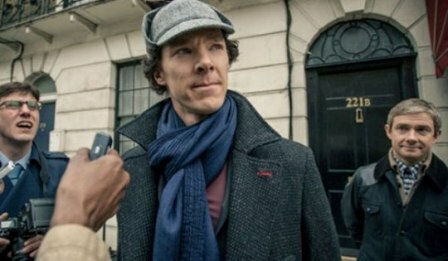 Sherlock offered us something new in “The Sign of Three,” which was broadcast last night in the United States: Sherlock Holmes as the hero of a ROM-COM romantic comedy. The couple in question is Sherlock and John Watson, of course. Sherlock plays the role of the boyfriend as we often see him in movies today: fixated on his work, uncertain of his feelings, and afraid to commit. 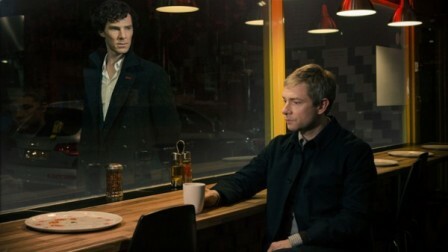 All is fine on Baker Street until John falls in love with Mary and threatens their bro-mance. The relationship deepens, but is also complicated, when John asks Sherlock to be his best man, which requires Holmes to both think about his feelings and confront the fact he doesn’t like to think about them. Watson and Sherlock bond during a drunken stag night, which lands them in jail. 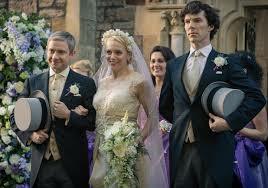 Sherlock delivers a funny-awkward-touching best-man speech, and following the pattern of the ROM-COM, all ends happy with dancing to 70s music at John and Mary’s wedding reception. I give the Sherlock-team points for trying something new and surprising me. And I enjoyed the results okay I guess. But ideally, I’d like my reaction to innovation to be “Well done!” and not “What the heck?” and “What the heck?” was my reaction. Part of my difficulty is that the tone of “The Sign of Three” is so different from that of the first two seasons that I might as well have been watching another show entirely. A bigger problem for me is that a lot of the episode felt as if it could have been almost any romantic comedy that rolls out of Hollywood. Or worse, one of dozens of television sit-coms that deliver yucks and “aaawwws!” in equal measures and with equal lacks of flair. Two unsolved and seemingly unrelated mysteries come together and allow Sherlock to unravel and prevent a murder in progress at John and Mary’s wedding. The management of the plot elements and structure was neat (a strength of Moffat and Gatiss that abandoned them last week) and the story played a chess game, and then showed us how it was played, which is something the Conan Doyle did very well when he was on his game. I was looking forward to the US premiere Sunday night of the new season of Sherlock. So I’m sorry to say I thought “The Empty Hearse” came up short. As I said in my Sunday post on Sherlock, what I particularly admired about Steven Moffat and Mark Gatiss’ adaptation was the greater depth and feeling they gave to Arthur Conan Doyle’s characters and how well they crafted their plots based on Doyle’s stories. Both those strengths seemed to have abandoned them in “The Empty Hearse” however. The largest issue at the beginning of Season 3 was how Watson — who believed Holmes had died at the end of Season 2 and intensely grieved for him — would react to Holmes’ reappearance. This could have been a fearful reckoning, but instead Moffat and Gatiss’ play it for yucks and not just once, but again and again; and while the jokes were funny, they were also decidedly beside the point and began to get old as the episode ticked down to its conclusion. The story also had problems. In the first two seasons, Moffat and Gatiss showed themselves to be masters at creating intricate, compelling mysteries that Holmes satisfyingly untangles while at the same time deepening the conflicts and relationships among their characters. In “The Empty Hearse,” the terrorist plot is more perfunctory than intriguing; its solution hinges on resolving a single — and not very complicated — mystery; the bomb-diffusing climax is played for more laughs; and the story itself seems unsure of who the bomber is and why he is bomber-ing. “The Empty Hearse” also doesn’t explain how Holmes faked his death at the end of Season 2. Instead, it offers three speculations, two thrilling and possible, one fake and hilarious (though cruel to Watson if you think about it), none confirmed. It seems as if the last explanation is the truth, but I have my doubts whether we are meant to believe it. The scene feels a bit too coy and a bit too cute to give me confidence. (Maybe I’m wrong.) I actually don’t mind that Moffat and Gatiss leave me in some uncertainty. But in the general messiness of the episode, that feels more like an oversight than their intention. The result is that “The Empty Hearse” delivers a grab-bag of scenes and sketches that often entertain, sometimes move (primarily on the strength of Martin Freeman and Benedict Cumberbatch’s performances), but plain just don’t hang together. 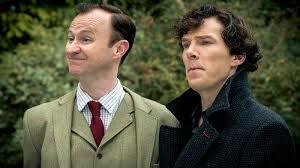 I’m hoping Moffat and Gatiss regain their stride this Sunday. We’ll see.